June 21 2018, 2:43 p.m. Images of Yemenis killed in the 2015 battle against the Houthis are painted on the walls of main streets in Aden, Yemen. Since March 2015, the Iran-allied Houthis and other factions in Yemen have been entwined in a civil and international war with Saudi Arabia and its coalition partners, who are fighting to restore the government that the Houthis overthrew. Coalition airstrikes — supported by refueling, munitions, and intelligence from the U.S. military — have pummeled not only Houthi military positions, but also homes, schools, business, and essential infrastructure in an attempt to bring Yemen to its knees. The strikes have often been indiscriminate, and Saudi Arabia has been accused by Human Rights Watch of war crimes. Last week, the port city of Hodeidah came under attack by pro-government forces backed by coalition partner the United Arab Emirates, threatening to plunge the country deeper into humanitarian crisis. At least 10,000 civilians have been killed during the war, although many deaths go unreported, and the true number is likely much higher. Ordinary Yemenis have suffered in many other quieter ways. Those with chronic illnesses are dying in droves. With limited access to dialysis, chemotherapy, diabetes medications, and supplemental feeding for malnourished children, and almost no possibility of leaving, poorer families are simply giving themselves up to fate. 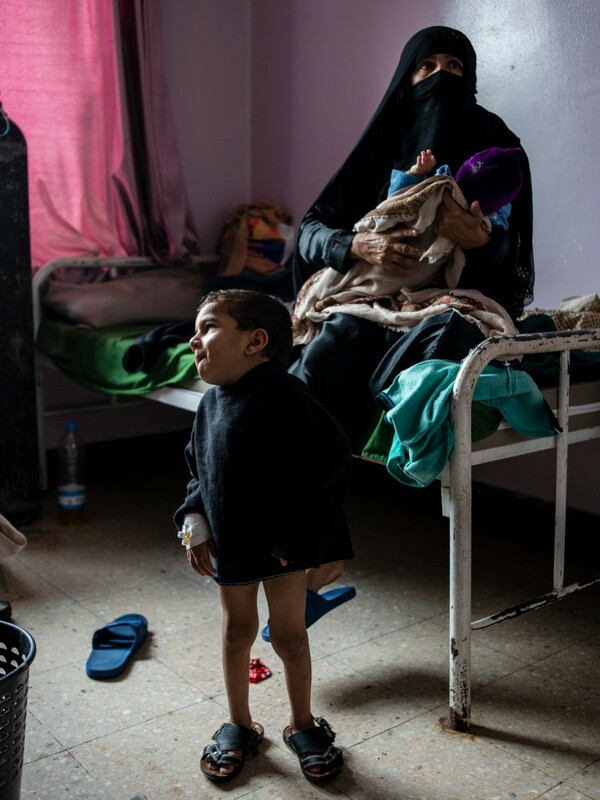 Yemeni families and nurses walk through the malnutrition wing at Sabaeen Hospital in Sanaa on May 4, 2018. Most hospitals in the north are functioning at a minimal levels, constantly short on supplies, while their staff have remained unpaid for months. “He didn’t eat well from the day he was born, but for the last three years, it’s been very bad. We couldn’t afford to vaccinate him. … He’s been here for 20 days, but there’s no point in staying. We’re going home tomorrow,” she said. 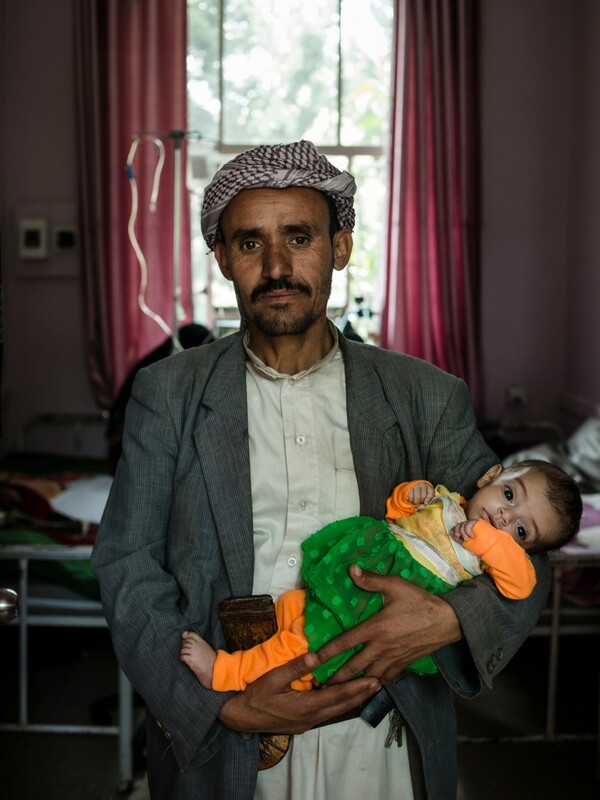 At a center supported by the World Health Organization in Bani Mansur, a village outside Sanaa, a 1-year-old Yemeni girl with beautiful eyes and long lashes sat listlessly in her mother’s arms, a feeding tube taped to her cheek. Dr. Majed al-Qadasy at Jumhuri Hospital in Sanaa on May 4, 2018. Al-Qadasy is responsible for the dialysis program at the hospital. 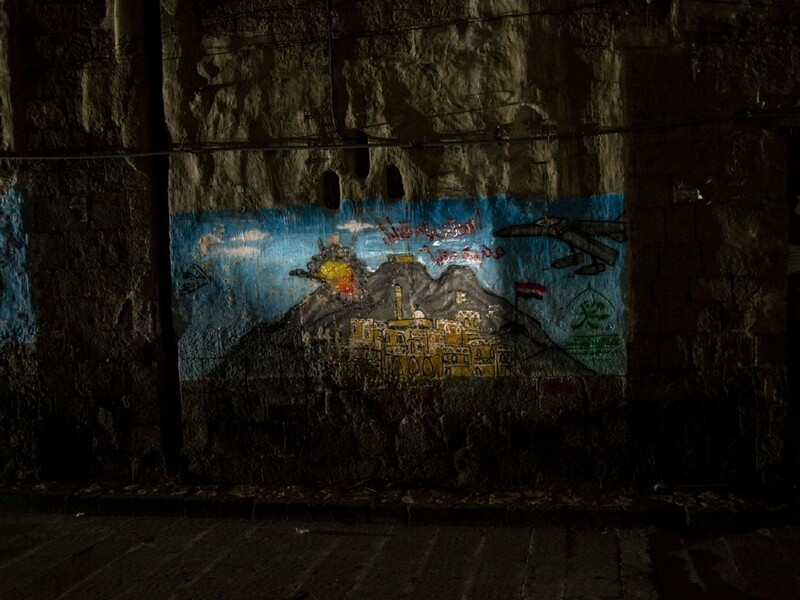 Upstairs in the recovery wing, al-Qadasy spoke with Ahmad Mohammad Morshid. 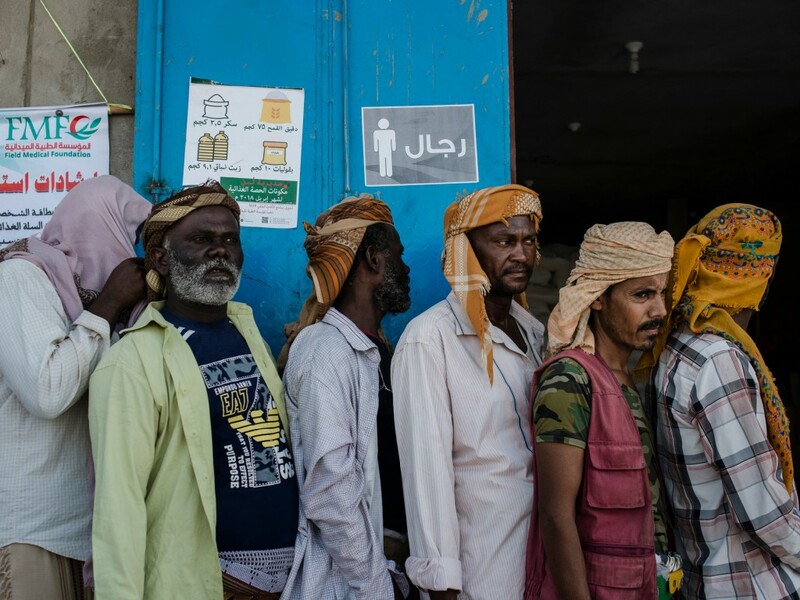 The 33-year-old farmer and qat seller from a rural village in Dhamar waited months to get dialysis when his kidney failure started — he simply couldn’t afford the treatment. When he arrived at the hospital, emaciated and belly swollen, he was nearly dead. After a single treatment, he had the strength to sit up in bed. Some Yemenis who have managed to maintain their wealth support local organizations like Dar al-Shafaqa, or “House of Compassion,” which gives chronically ill Yemenis from rural areas a dignified place to live during their treatment. The unassuming building on a side street in Sanaa houses over 100 Yemenis with cancer and kidney failure. Two young boys, Abdo and Bashir, kicked a ball around the yard, wearing hats to cover their lack of hair from chemotherapy. An elderly man from Mahwit with kidney failure wandered the halls, talking to other boarders. Upstairs in the women’s wing, three separate rooms were full of women who have cancer; they were wrapped in heavy blankets, some silent, some moaning, all accompanied by a mother, daughter, or aunt tasked with looking over them until they return home, either recovered or to die. Yemeni nurses tend to kidney failure patients on dialysis in Hajjah, Yemen. Over winding mountain roads three hours northwest of Sanaa, Sultan Masood, a 28-year-old nurse, runs the dialysis center at Jumhuri Hospital in Hajjah City. Before the war, he said, his hospital treated 250 regular patients. Last year, because other centers in the region have been destroyed, they saw 900. Officials and humanitarians are at a loss as to how to keep their hospitals running. Everyone in the health system dreads cholera season, which accompanies the arrival of spring rains. According to Masood, Jumhuri Hospital treated 8,000 cases last year in a six-month window, using a school for treatment when their facility was overrun. A Yemeni boy walks through the sand back to his tent in Mishqafa Camp on April 23, 2018. Most of the families in the camp come from impoverished areas near the front line, but the camp is also destitute. The north has received the brunt of coalition airstrikes and the blockade, but the humanitarian situation is dire across the country. Thousands of Yemenis have fled south from front line areas in Hodeidah and Taiz, where Houthis battle various local factions supported by the coalition. Many of them have ended up outside desert villages in Lahij, just north of Aden. While some families have managed to move in with relatives, poorer families and those from the darker-skinned muhamasheen class, who often face discrimination, have taken refuge in makeshift settlements with little support from international NGOs. 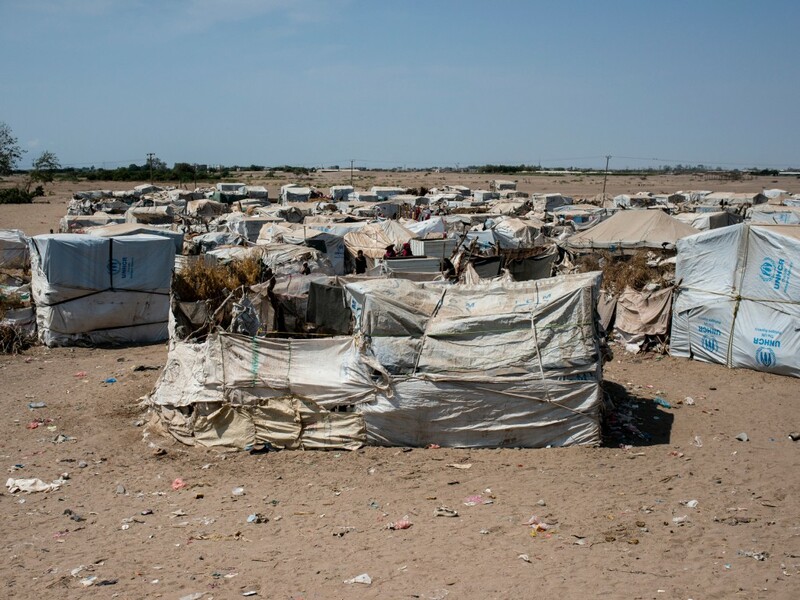 In Mishqafa camp, the local sheikh responsible for the area said that 265 people live in horrendous conditions: There is no running water or electricity, no school or health care facility. Tents are haphazardly tossed together with tarps, rope, brush, and branches, with clay stoves made by hand just that morning baking out in the sun. Sheikh Zaky claimed the camp is supported with funds from UNICEF, the U.N. humanitarian agency, and the World Food Programme, but if those international aid groups are present, their support isn’t visible. “We [local villagers] are trying to help these people. They are our neighbors. So we’re trying to arrange more distributions through a local NGO,” said Zaky. Yemeni women from the Warazan area of Taiz sit in a tent to escape the sun on April 23, 2018, in Mishqafa camp. Dozens of women who had fled from Warazan, a village near Taiz and the site of an active front line, crowded into a tent to share their stories. Most had been in the derelict camp for two years, having escaped by bus in the middle of the night to flee the fighting. Men in the makeshift camps attempt to get work in neighboring villages, and many go each week to a food distribution organized by the World Food Programme to get flour, pulses, oil, gas, and rice for their families. The majority of the families were poor to begin with: laborers, fishers, or street sweepers. None of them see returning home as an option while fighting goes on in their villages. Supporters of the Houthis gather for prayer on April 28, 2018, ahead of the funeral of Saleh al-Samad, a Houthi political leader who was killed in an airstrike. Supporters of the Houthis at the funeral for Saleh al-Samad. Yemenis are resilient, with a strong social structure where neighbor supports neighbor, and friend supports friend. Years of airstrikes, front-line fighting, displacement, and shortages have not ended the war, as the Saudi-led coalition assumed they would. 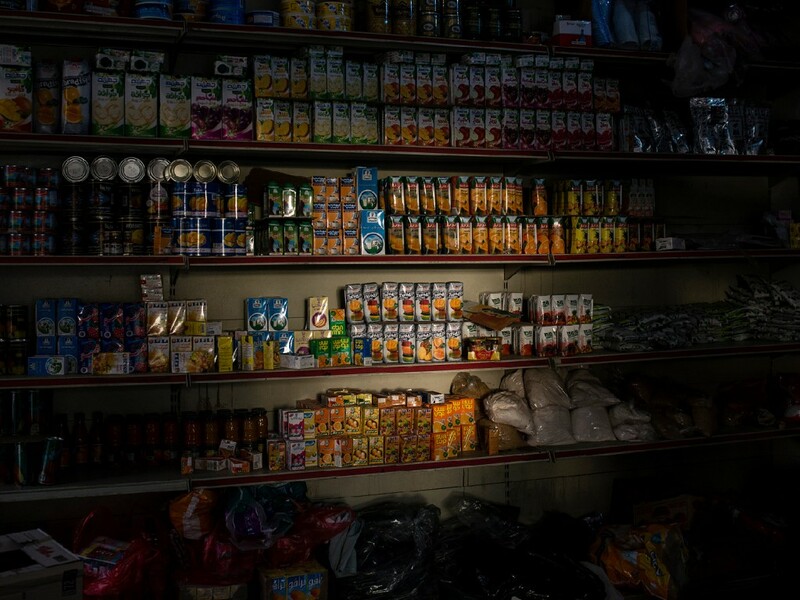 But despite their defiance, the conflict has brought Yemen to a point where its citizens can’t even obtain basic needs, and the nation is weary. This story was supported by Women Photograph and the Pulitzer Center on Crisis Reporting. Top photo: Kafaya, whose name means “enough,” sits in the arms of her mother on May 7, 2018, in Bani Mansur, Yemen.